Mastercraft Glacier-Grip's non-directional tread pattern allows for cross rotation. 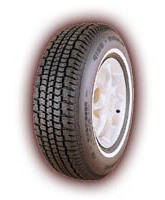 This benefit helps balance treadwear, thereby extending service life of the tire. The Glacier-Grip's computer-designed tread maximizes traction. Deep circumferential grooves provide excellent water and slush drainage. Lateral grooves and sipes create thousands of gripping edges for positive traction on snow and ice.